The feel of winter is in the air, here in Hyderabad. If you're outside the heat still burns your skin, but if you're inside the house, your toes get eerily cold you just wanna curl up inside the comfort of your warm bed :). Today's post is one of missing home and reliving some of the taste from my childhood, when life was truly carefree and 5 rupees was still a lot of money :). I got hold of this recipe from my dear friend Naro and have been meaning to make it but kept postponing it because it is a deep fried delight. But with the winter air throwing up memories of home and the good ole days...i just had to make it :). I grew up enjoying this fried bread in one of the tea stall back in my home town. They use to serve it fried like a puffed up ball. Fresh out of the pan, it use to be absolutely irresistible. I used to make sure that my mom brought this back with her whenever she go to the market :). This recipe is a very versatile one. 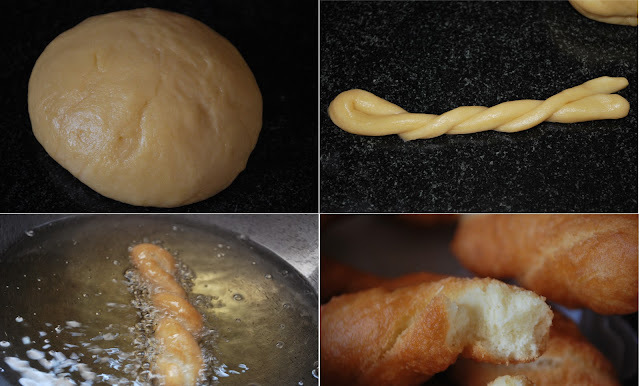 The same recipe can be used for making fried doughnut, back at home we call it Naga Doughnut and this is something we loved making as kids on Christmas Eve staying up till 12 O'Clock to be gifted to friends and families on Christmas morning :). My kiddo liked it, t'was his breakfast :). I'll definitely be making this again on Christmas Eve and keep it as a Christmas tradition for this family ;).